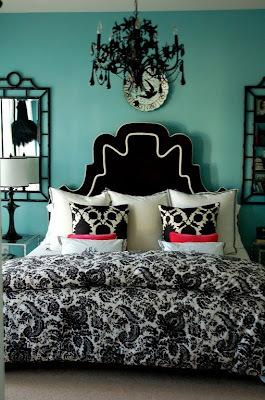 I found this beautiful turquoise bedroom via House of Turquoise. I think it would look even better if the chandelier and mirror frames were hot pink as well to give the room a little extra pop of hot pink coloring. To find some more modern bedroom, platform beds and overall bedroom furniture u can visit spacify.com. I don't have the guts to paint a room turquoise but always love seeing them! Thank you for visiting my blog! Jessica-Thank you for the comment and site recommendation...I'll check it out.